The Political Science Club works to expand student knowledge of and participation inpolitics at the local, state, and national levels. Club members meet to discuss important domestic and international political issues and events and to host educational events including speakers, voter education campaigns, and political debates. The club is also designed to allow students interested in politics to socialize and interact with others who share this interest. The purpose of this organization is to expand student knowledge of and participation inpolitics at the local, state, and national levels. Club members meet to discuss important domestic and international political issues and events and to host educational events including speakers, voter education campaigns, and political debates. The club is also designed to allow students interested in politics to socialize and interact with others who share this interest. 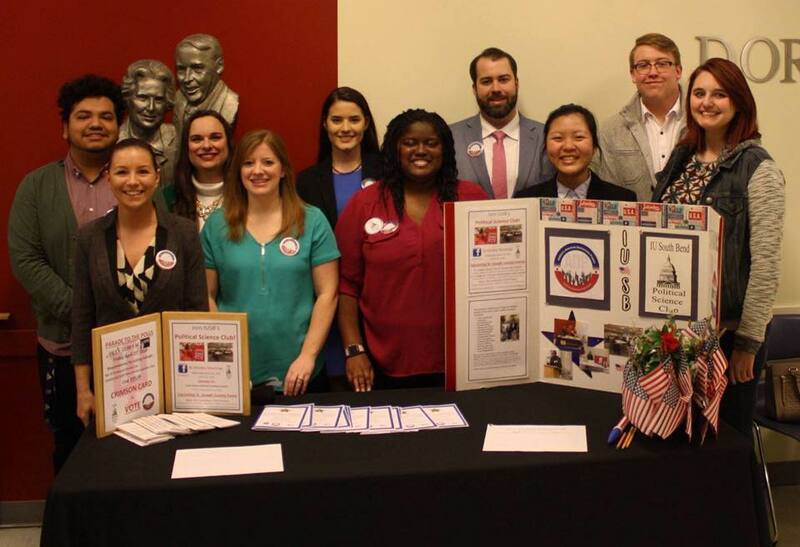 Membership is the Political Science Club is open to all students expressing interest and enthusiasm for politics. Members must attend 50 or higher percentage of meetings to retain voting privileges. The IU South Bend Political Science Club shall be governed by an executive board consisting of a president, vice president of public affairs, vice president of event planning, secretary and a treasurer. misses more than one non-business meeting and one business meeting in a given semester (Does not include weekly television viewing). Such official excuses should only be granted under the most serious circumstances. In the event of an absence, every attempt should be made to clear the absence with the president before the meeting and to make sure that one’s official responsibilities are covered by another club member. If the president is the person absent, he/she must notify current vice president(s) of this absence at least 24 hours before the scheduled meeting. Amendments or issues not specifically addressed in this constitution may be decided with a 2/3 vote of the active membership. A quorum of over 50 percent is required for voting.